The Western Canadian Ringette Championships are taking place in Calgary, Alta from Wednesday, March 25, 2015 to Saturday, March 28, 2015 at Markin MacPhail WinSport’s Canada Olympic Park. Teams from British Columbia to Manitoba are participating in the U14AA, U16A, U19A, and Open A division; these are the top teams that won their provincial championships. The host teams from Calgary are: U16A South Calgary Sharks, U19A Calgary North Rage, and Open A Blitz. “It is an absolute honour being chosen to be the hosts for the 2015 WCRC. We take the privilege very seriously and are working extremely hard to make this one of the most memorable WCRC in the history of the event,” says Judy Renneberg, chair of this years WCRC. Games start at 8 a.m. on Thursday, March 26, 2015 and continue through to the last final that starts at 2:15 p.m. on Saturday, March 28, 2015. There are 75 games scheduled (including mini games if needed) plus ice needed for the skills events, opening ceremonies, and media coverage for more than 122 hours of ice. “It’s an absolute honour for me to be part of Westerns this year, and I can’t even begin to tell you how excited I am,” shares Ryleigh Dodd, of U16A Calgary North Core that is representing Alberta. 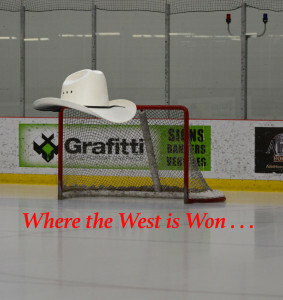 “Going to Westerns means competing against the best in Western Canada. It’s ‘show time’ by showing to the country what we are capable of and how we can play,” says Kira Hodge of U14AA Calgary 212. This event started out in 1997 for only the Tween AA (U14AA) division to offer a developmental experience for the Tween AA teams. There were only four teams participating from Alberta and Saskatchewan, and participation grew the next year to include Tween AA teams from all four Western provinces. At the time it was thought that Westerns could give the athletes exposure to an interprovincial championship in order to give them valuable experience from which to draw from in the future at a Canadian Ringette Championship. In 2002 the U16A division was granted inclusion to Westerns with the U19A inclusion in 2003, and the Open A division was included in 2009. “From my perspective, as a ringette parent and coach, having the WCRC’s in Calgary is a great opportunity to showcase the sport of Ringette in our city, and an event like this can really create an awareness for people who may not know much about the sport,” explains Leigh Sauer, a coach for U19A Calgary North Rage. Of the 27 teams participating 12 are U14AA, five are U16A, five are U19A, and five are Open A. There are 15 officials in total and four supervisors from across the four western provinces. “We are so excited to welcome 27 teams, over 450 athletes, and hundreds more parents, coaches, team staff and fans to the incredible Markin MacPhail Centre where many of Canada’s Olympic athletes train and compete,” shares Renneberg. The games that this tournament offers are going to be the best ringette that the west can offer. “We hope to make Calgary proud along with our good friends on the South Calgary Sharks who are also an amazing team,” says Dodd. Be sure to follow the tournament on Twitter, Instagram, and be sure to check the Facebook page. This entry was posted in Articles, Ringette and tagged in play it love it live it, ringette, ringette season, ringette since 1963, since 1963, team sport, the fastest game on ice, tournament, Tournament season, tournaments, wcrc, wcrc2015, western canadian ringette championship, westerns in calgary.